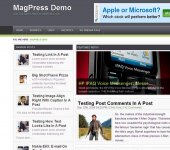 Newster is a 3 columns fixed width news magazine style WordPress theme with an easy to use theme options. Newster comes with features such as Smoothgallery slider for its featured content, customized featured category block, customized more related category on single page, adsense ready and many more features. Get Test4Prep’s latest JNCIA Certification exam questions and ITIL Certification training materials. Our high quality Cisco CCIE Certification exams questions & answers help you to prepare well fore final exam. Thank you for the nice Theme!!! I have a question, how can I add my own logo instead of text? Upload your logo inside the theme images folder. Adjust size accordingly. any theme`s updates about the option of custom menus available as option after WP 3.0? I installed theme Newster and even after trying some other themes, I felt this was the best of them all. The only issue I have is that I would have liked to have the categories as well as pages menus near the top. Maybe the pages links’ menu above the site name/logo and the categories menu below the site logo or at the bottom of the header. I am not a php expert… in fact I can barely make out what the programs are saying. Is there some easy way to do this … or can you pls provide me some coding for this. I am sorry if I am asking for a lot. Hai. That required an addon coding. Please email me regarding this matter (contact us above). Newster is a great theme. I have been searching for a good free theme that actually works and can go with my news website. I am glad I found Newster. However I am unable to set up the featured slidebar. The posts are showing up but the images are not. Where do I set up images for featured slidebar and get them to show? Help would be immensely appreciated. Hai. Please put more than 1 post on the slider for it to work properly. Thanks. Thanks a lottt for your prompt reply Ronald. Okay, I was a doof there and when I put 3-4 posts, the images are being displayed in the slider. Another problem that I have been struggling with is that the posts line up only in one column. You can see the site and view the problem if you wish. Around 7-8 articles are being displayed in the first column and the remaining articles are listing on page 2! What can be wrong here. I haven’t tweaked anything from the code so far…. I was able to fix the earlier issue. In fact, I could not fix it but was able to tell the cause. When I change the font size of the page (Ctrl + scroll up/down), it displays fine.. but when I reduce the size the posts line up in a single row. Is there some way of fixing this? Btw, I do have to congratulate you. While searching for solutions to this problem, I came across Bizine and I must say all these themes are so clear and easy on the eyes, yet extremely handy and usable. I really, really do wish to thank you for making these excellent themes available free. My first adsense profit will go to buying you that coffee and hopefully more in a bid to encourage you and everybody else to share online. Just let me know in case you have a fix for the problem I mentioned. Hai. You can replace the wp_list_pages to wp_list_categories within the dropmenu section in header.php. Please refer to the WordPress codex page for variable available for wp_list_categories. Thanks. I noticed that the option to customize my background in settings is not there for this theme. Is there anyway to add a custom background on the main page in the borders? Let me know if you can! Hai. You can try manually edit the style.css > #wrapper to add your custom background image. Love your themes! I am using the Newster theme. Why are my images in my post not showing up? Please help if you can. I see everything looks fine now. Thanks again for using our theme. When I chose imag-feat the slider does not work. I have a black background. For the post ID number should I? For articles, I’m one /% postname% /. It is a google translation, sorry. Hai. You can find the POST ID by going to wp admin > Posts > Posts and mouseover the post title and you’ll see below your browser status bar “post=[number]”. Take that number and insert it inside the featured slider setting, separate posts by ‘comma’.